Something struck me the other day. I could be halfway through my life (assuming there are no unforeseen accidents). 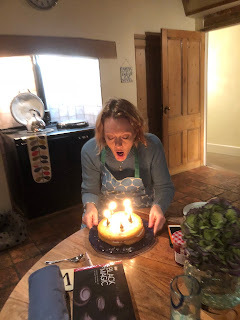 Not so long ago, I celebrated my 45th birthday and judging by my grandmother's longevity, I could have nearly half a century left. I've reached a tipping point. All of a sudden, the next 45 years feel rather precious. A bit of a milestone! Usually, I wake up on my birthday and think, oh bugger, another year older! How did that happen? This time, I lay in bed feeling a little overcome. It's like I've reached the top of the hill and now I'm about to free-cycle down the other side. Two themes are dominating my notebook this week - literary festivals and our imminent move to a new house. In amongst pages of removal quotes and a transcription of my conversation with BT about changing over our broadband, are my notes on the Henley Literary Festival and the Cuckfield Bookfest. As ever, our local lit fest in Henley offered up a smorgasbord of knowledge and current affairs. A highlight for me was attending a session by my fabulous friend, Cathy Newman, who was promoting her new book, Bloody Brilliant Women. It's finally happening. After three years of viewing properties and hoarding house particulars, we are on the move. Let's not get carried away, it's only five minutes down the road, but this is a BIG deal for us! Most people would be super-excited (and we are) but we're also feeling a little bit funny inside... It's us after all. Our family is not known for its gung-ho, fly-by-the-seat-of-our-pants approach to life. There's just too much fretting to fit in.